Fighting has broken out again between the Burmese army and Kokang rebels near the Sino-Burmese border. The clashes coincide with a meeting between members of the Northern Alliance – Ta’ang National Liberation Army (TNLA); Arakan Army (AA); Kachin Independence Army (KIA); and the Kokang-based Myanmar Nationalities Democratic Alliance Army (MNDAA) – and the Chinese special representative in Kunming. The United Wa State Army (UWSA) was also represented at the Kunming talks. China’s special representative for Burma, Sun Gunxiang (left) and Bao Youxiang, the leader of the United Wa State Army (UWSA) (right). Northern Alliance news sources report that at 7am on May 11, heavy weapons were used relentlessly to shell MNDAA bases at Hon-aik in the Kokang region. The MNDAA reportedly responded with ground force attacks. Hostilities were expected to escalate and intensify as more soldiers are being deployed to the region, according to the report on May 11. An unspecific number of casualties and injuries were also reported. 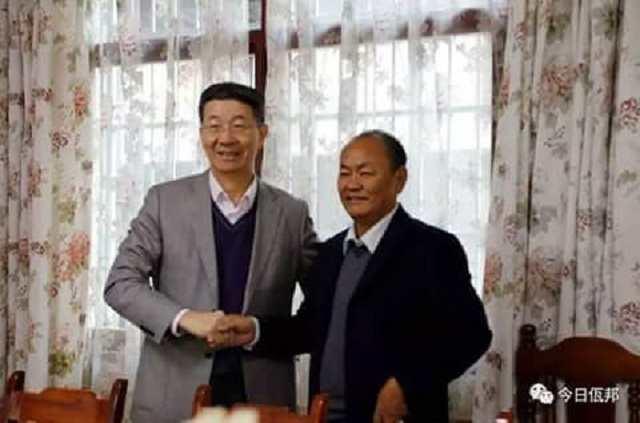 In recent days, China’s special representative for Burma, Sun Gunxiang, met leaders of the Northern Alliance and the Wa in the Yunnanese capital of Kunming to discuss the ongoing peace process in Burma. The Northern Alliance, as agreed in the recent Panghsang Resolution, maintains that only when all seven ethnic armed organizations, including the Kachin Independence Organization (KIO) and Shan State Progress Party (SSPP), are accepted and recognized by the Burmese government, will peace negotiations be able to proceed, Brig-Gen Tarr Jode Jarr, the deputy chairman of the TNLA, told reporters. China’s Special Representative Sun is due to speak next to the Burmese government to convey the outcome of talks in Kunming. Burma’s State Counselor Aung San Suu Kyi is slated to travel to Beijing on May 14 to attend the “Modern Silk Road” or “One Belt, One Road” (OBOR) project, an international forum based on a developing Chinese business model. The current armed conflicts in Kachin State and northern Shan State are reportedly on the agenda at the OBOR conference. Han Yawnghwe, a Euro-Burma Office (EBO) delegate who closely follows ethnic affairs, said in a recent interview with The Irrawaddy that China will continue to exert influence over Burma until a resolution can be found to the armed conflicts in the northern regions.